For the first time ever, last year more humanist wedding ceremonies took place in Scotland than those conducted by the Church of Scotland. Figures released by National Records of Scotland show that 4,290 humanist wedding ceremonies were conducted in 2015, compared to The Church of Scotland’s 4,052. Almost 80% (3,378) of those were conducted by Humanist Society of Scotland (HSS). The rest were conducted by other independent groups, notably the Humanist Fellowship of Scotland and Independent Humanist Ceremonies. Since they were first authorised in 2005, the number of humanist wedding ceremonies has increased nearly fifty-fold, while Church of Scotland weddings have seen a steady decline. 2005 saw just 82 humanist ceremonies take place, while there were 8,686 Church of Scotland ceremonies. Since then HSS, which helped secure the authorisation, has carried out more than 20,000 ceremonies, and has 115 celebrants who also carry out funerals and baby-naming ceremonies. 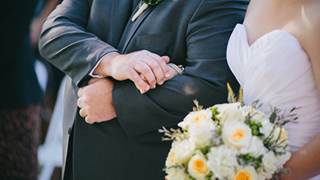 HSS Head of Ceremonies and Chaplaincy, Lynsey Kidd, said the society was "delighted to see that humanist weddings continue to grow in popularity." An editorial in the Scotsman said the increase in popularity for humanist ceremonies is due to a "cultural shift" which shows that: "Society is increasingly secular, and when offered an alternative, many people are taking that option." It adds: "The rising trend could also have implications for other countries, since Scotland was one of the first in the world to permit humanist weddings." Unlike in Scotland, humanist ceremonies are not recognised in law, in England, Wales, and Northern Ireland. Humanist celebrants are free to conduct ceremonies, but these must have their legal formalities processed separately at a register office. In 2014, over 95% (1,813) of respondents to a government consultation, in England and Wales, agreed that there was a substantial case for a change in the law to establish humanist ceremonies. In 2015 both the Labour Party and Green Party included legalising humanist marriage in their election manifestoes. The British Humanist Society has promised to pursue a change in law "in every way they can". Speaking of the statistics Rev Norman Smith, Convener of the Mission and Discipleship Council at the Church of Scotland, said churches remain a special place to get married. "When couples stand in church where generations have stood before pledging their love to one another, it is a reminder that human love endures. Standing before God is a reminder that the Christian God is a God of love who delights in people. "The Church of Scotland has always stood with the people of Scotland and helped them take this step together. That is still the case and we would encourage anyone considering marriage to remember their local church when thinking about their very special day." Speaking to Christian Today, Rev David Robertson, Moderator Emeritus of the General Assembly of the Free Church of Scotland, said the new figures came as "no surprise". "Given that less than 10 per cent of the population actually attend any church in Scotland, and that nominal Christianity is in freefall, then it should come as no surprise that many couples will choose humanist weddings. Why would a non-Christian want a Christian wedding?" he said. Robertson also said the humanist understanding of marriage appealed to "a shallow, superficial" culture. "In the church we will continue to offer the full riches of Christian marriage, rather than the empty promises of Humanism!" he said.